Here are 14 ideas to help you beat writer’s block. 1. Has Your Company Got Original Data To Share? Original studies that offer new information on a popular or under-researched topic are great for links and audience engagement. With this in mind, do you have original insight you could offer within your industry? If you do, this could form the basis of some great content. Once you’ve got an angle, you then need to plan out how you’ll position it for success. If you have loads of interesting data for example, you might be better off pitching it with some informative and engaging data visualisations. These can serve the dual purpose of enhancing the pitch and giving the website in question a ready-made resource to use. 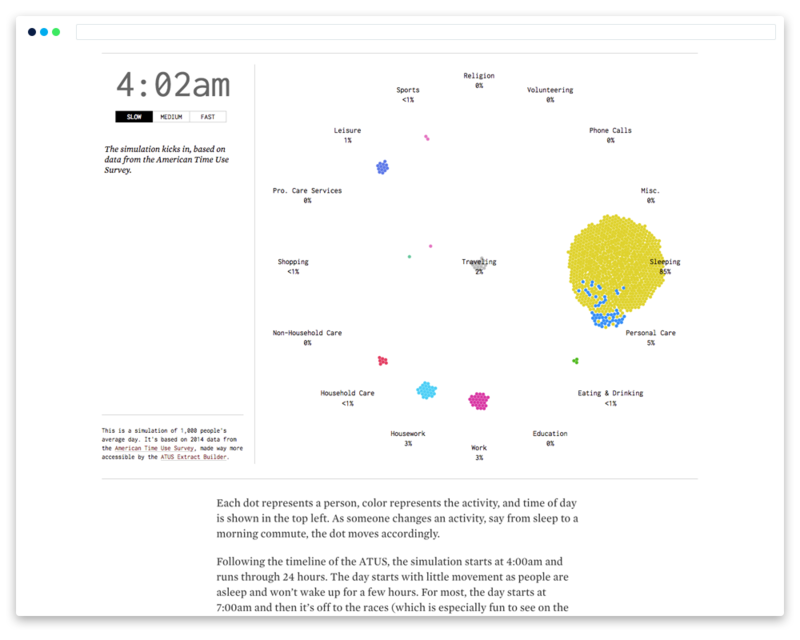 See the full version of this awesome interactive FLOWINGDATA data visualisation for 'A Day in the Life of Americans' here. 2. Could You Start With The Visual Aspect? Considering the visual appearance of your post is not only a vital part of any content you produce, it can also help you focus your efforts more effectively. People are impatient, particularly when it comes to how they access information online. They typically want content that’s easy to digest and providing this, whilst retaining the quality you’re aiming for, can be tricky. By focusing on the visuals first, you can ensure they work perfectly within your content and avoid you being left with something too wordy. Consider how any graphic elements could add genuine value to your content - and improve its potential to capture quality backlinks. In this Sheffield coffee guide we put together for Gnome Student Homes, we produced a series of artistic visuals to break up the post. 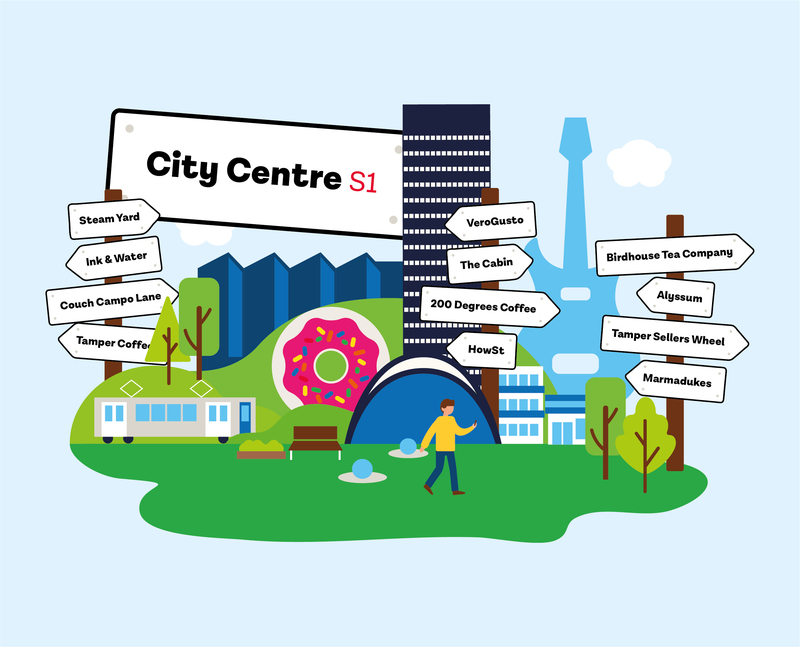 These were designed to include landmarks and features related to Sheffield culture. 3. What’s Missing From The Best Organic Content? Even in the most competitive niches, there are almost always ways that existing content can be improved upon. Whilst it’s true that domains that carry high authority can be notoriously tricky to outrank, that’s not to say it can’t be done. Is the existing content too short/could it be expanded upon? Could a video or informative visuals improve what’s available? Is the literature available unnecessarily complex? Are there link opportunities you could exploit with your own guide to help you outrank the guides that currently enjoy the most prominence? 4. Have You Solved A Problem That Could Help Others? Tutorial style guides offer all sorts of value. Educating your customers, encouraging backlinks and building trust with Google are just a few of the many reasons you should be producing them. If you’re struggling to think of a suitable idea related to the area, think about your day-to-day activity in your job and make a list of any recent problems you encountered and solved. Then consider re-producing these ideas into blogs. Our guide to PHP Directory Listing Script remains one of our top-performing posts on the Evoluted blog. 5. Are There Related Sites That Would Be Interested In Your Content? If you’re producing content with the aim of acquiring links, as well as traffic; doing this entirely through your website can be challenging. You have to persuade an external website to cite your content, which means they have to update an existing post or include you in something new. Instead, you could consider whether these websites would be more likely to benefit from an entire post. Yes, you’d lose the potential for your site to acquire organic traffic, but the benefit from a great link could more than offset this. Whilst guest posting is an old tactic - and has also become far more difficult - there are still loads of opportunities out there. Putting yourself in the mindset of a different audience can also help you develop a fresh approach to your content. Here you can see a post we contributed to the CapsuleCRM website. 6. Is There A Content Gap? Don’t be put off if you do research around a topic you want to cover and find that no one has written anything relevant related to it. It could just mean that there could be a golden opportunity for you to take advantage of. 7. Is The Existing Ranking Content Unnecessarily Complex? If your primary aim is to drive search engine traffic with your content, it’s important to assess the competition. An understanding of the power of the domains you’re going up against is important, since this will help you to temper the expectations of stakeholders. A great example of how you could do this is if the post chosen is one that’s particularly wordy or poorly formatted. If it is, could you produce a more concise version of the post that better answers the query? Could this be done in a listed, numbered or tabled format? If so, you might have unlocked the key to producing a post that enables you to leapfrog your competition for a valuable search query. The existing content available on the differences between 1.3g and 1.4g fireworks was needlessly complex. We created a simple post with FAQs that secured a Featured Snippet, beat off competition and gained exposure on forums that further knocked down competitive pieces. 8. Could Your Contacts Benefit From Your Expertise? If you work in any content or outreach role, generating exposure and links for your content will be key. To assist with your efforts, building up a database of useful contacts and then nurturing those relationships over time can be priceless. You’ll be surprised how quickly you can build out a big database of contacts, just from your existing link building activities. Once you have this in place, you can then look to speak with those contacts to try and secure coverage when you have interesting new content. Importantly, you can do this ahead of beginning to create the content, which means you can gauge whether or not it’s worth producing - particularly if your primary goal is to acquire links. If no journalists are interested in it, that might be a sign that it’s less suitable for link acquisition purposes. That’s not to say you shouldn’t produce it for a purpose such as search traffic acquisition though. Once you’ve identified the people you want to target, spend time honing your pitch so that it sells the content you have in mind. If the goal is to get a website to link to your final piece, make sure you give them a great reason to. Or, if you’re looking to guest post, make sure the content is worthy of the publication’s audience. 9. Could You Update A Historical Post? Top-performing historical posts can be a goldmine for driving additional traffic and securing Featured Snippets. It’s worth monitoring such posts on an ongoing basis, as there could be an opportunity to improve the post and strengthen its existing standing. Alternatively, you may find a rival website has produced a similar post that’s now outperforming yours - leaving you needing to claim your spot back. You can be sure that the bigger websites will have a strong understanding of what searchers want to read about, so this can act as a solid gauge for your own ideation. Here you can see a couple of examples of the latest posts on the Content Marketing Institute website. 11. Could You Steal A Competitor Link? Using a tool such as ahrefs, you can see what links your competitors have and which websites are providing these links. Armed with this information, you can then start to think about replacing those links. If you achieve all of these targets, you’ll strike a perfectly reasonable blow to your competitors and boost your own search visibility chances in the process. At the end of the day, Google wants to rank the best content so you’re just making sure they pass value to a better piece. 12. What Is the Search Query Data Saying? How much you can see is ultimately down to where you’re viewing the results. Google’s search query reports in Webmaster Tools, for example, will show you some of the searches that people have made to get to your site. You can then use this information to see if there is a query people are commonly making to get to your site, that could be answered more effectively. Alternatively, you can use the information presented by other tools such SEMRush and ahrefs. By analysing the volumes of popular queries, you can identify opportunities for content creation. Each query should be analysed on a case-by-case basis, as some keywords with lower volumes may present a content opportunity with very little competition, for example. This image shows some of the statistics you can expect to see when conducting KW research in the ahrefs interface. 13. Could You Offer A Follow-Up To An Existing Piece? 14. Is There A Gap To Fill On The Conversion Journey? It can be hard to focus on anything but links and traffic when you’re deciding which content to create, but it can be beneficial to take a step back and think which other content angles you could focus on too. Reduce or increase the amount of copy? Add informative snippets of text that help direct users around the page? Add headings and improve readability? 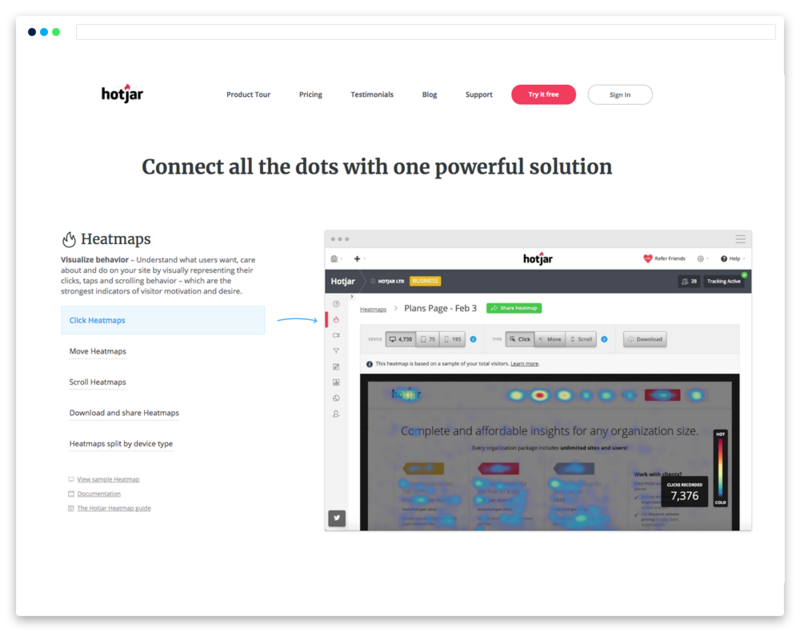 If you’re unsure how to make a judgement on which of these changes to make, you could install a piece of video tracking on your site such as Hotjar. You can then use this to watch how people interact with your site and try and gain insight into what changes you could test to aid them and drive more conversions through content improvements. Hopefully these tips can help you with your content creation and inspire some great new ideas. Simply by breaking out of your standard routines, you’ll be surprised how easy it is to come up with awesome content time and time again. Think we’ve missed anything? Leave us a comment below!